Haaretz is reporting today that a list of 45 prisoners in Israeli jails has been given to the Israeli government by the Hamas regime which controls the Palestinian Authority. Haaretz says these are "part of the deal to free captured Israel Defense Forces soldier Gilad Shalit." One of the names on the list is Abdullah Barghouti, described as "a senior leader in Hamas' military wing". It's a name that is known to the authors of this blog. 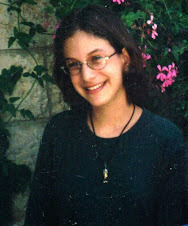 Barghouti built the bomb that ended the life of our daughter, Malki. A Kuwaiti who settled in the West Bank village of Burqa in 1999, he has been frequently described in the media - and from his own mouth - as the brains behind the Sbarro restaurant massacre on 9th August 2001. Arrested and put on trial in Israel, Barghouti pleaded guilty and told the court he "did this to kill as many Israelis as possible". He was rewarded in December 2004 with a sentence of 67 life-terms in an Israeli prison (report). In a later interview, he said: "I do not accept responsibility for their deaths. I feel pain, of course. They are little children. But the government of Israel is solely responsible." Below is an open letter we wrote a year ago about Abdullah Barghouti. It was originally published on the website we created in our daughter's memory. We wrote it as an open letter in response to the screening of a Bob Simon segment called Terror Behind Bars on the CBS "60 Minutes" television program. That segment focuses on three Palestinian mass murderers - Barghouti and two others. This coming weekend, the high-profile television program "60 Minutes" is going to give public exposure to a convicted murderer and terrorist called Barghouti. Speaking from an Israeli prison, the interview will show him taking credit for a massacre at a restaurant in the center of Jerusalem in August 2001 and another at the Hebrew University's cafeteria a year later. In front of a huge audience throughout North America, he will say of the number of people killed in the attacks he masterminded: "I feel bad because the number is only 66." 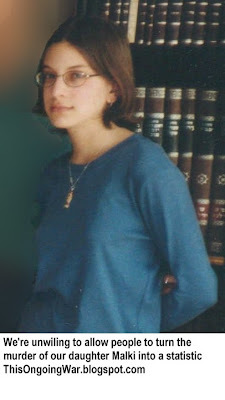 Our daughter Malki, fifteen years old, was one of Barghouti's 66. We, together with our neighbors living here in Jerusalem and throughout Israel, belong to the much larger number of living people about whom Barghouti feels so bad. We have nothing to say to Barghouti, and he has nothing to say that deserves to be heard. His opinions are worthless to us and to anyone with a sense of morality. His life is a disgrace to the society which nurtured him. But while we have no interest in him, we are very interested in the leadership of the society which has turned Barghouti into a hero - in their opinions and even more in their actions. The political leadership of the Palestinians was decided by a process that seemed democratic when their elections took place two months ago. Whether or not a democracy can truly function when gangs of heavily armed Arab thugs rule the streets of their towns and villages is a fair question. But the legitimacy of the Palestinian government is not for us Israelis to determine. The Palestinians and most of the media called it a democratic process, and no one seriously suggests today that the Hamas leadership lacks political legitimacy. Their stated viewpoints therefore have to be heard and analyzed. For those like us with a special sensitivity to terror, the Palestinian leadership today is the world's outstanding embodiment of unadulterated terrorism: a government which actively supports terror, promotes terror, honors terror and justifies terror. We hear them speak, and we hear the voice of terror. The current minister of the interior in the Hamas government says he will not arrest those who carry out terror attacks against us. His actions make clear that he should be believed. It's hard for us to imagine the government of Israel giving serious consideration to handing Barghouti his freedom and a license to go out and kill more innocents. It's not at all hard for us to imagine politicians and media analysts calling on Israel to do just that. Your restraint is beyond admirable. How a person can not be turned into a vigilante overnight after having experienced an event like what this beast perpetrated is hard for me to understand. I'm sorry for your sake - for the sake of decent people generally - but for yours more specifically, that this alleged human being still exists. I pray that he is released, and thereafter removed from this earth in a way that he cannot be whilst safely incarcerated, and in the way that his actions and his hatred warrant. Failing that, may he rot to death behind bars, and may G-d curse him by granting him a human conscience, one that will tear his mind to shreds with the belated knowledge of what he has done.